In a new CMYK document a frame text appears as black by default. That's fine. Unfortunately this Black appears in the cmyk slider view of the color pane not to be = 100 K but mixed 87 C + 78 M + 65 Y + 93 K, which additionally is a rich Black with 323 % print color. This complys to the default Black definition of an RGB document. Any chance to fix the default Black for all CMYK documents to 100 K? Even when exporting via PDF X4a which should leave all colours as they are. Huge miss here, for text this would be a disaster on a litho print. You can change the default object defaults by editing them in your document and then using Edit > Defaults > Save. It's probably best to do this on a new blank document so there are no unwanted changes being saved. This works for text colour, font, size etc, and shape colour, stroke etc. I have a print file, setup in the document from scratch. The swatch is reading as 100% black in Publisher. Exporting to PDF, even PDF x4a is turning the 100% black to 4 colour black. 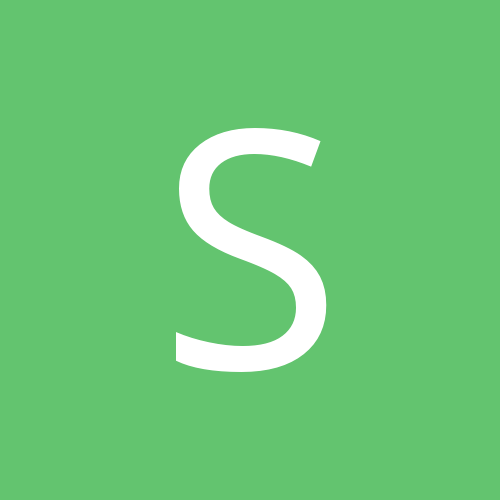 Can you attach a sample document that shows the problem? That normally happens, if document profile and output profile are different. The default Grays palette available in Affinity Designer and Publisher is not CMYK-based, so if you apply the Black swatch from that palette, you'll get a rich black. Define your own 100% K black swatch and use that one. Did not know this - thank you. Well then tha'ts the issue - they should be. I suggest having the CMYK swatches as default for all print docs. 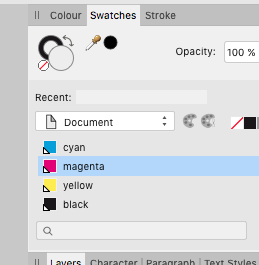 In InDesign the swatches palette has the 4 process colours, Cyan, Magenta, Yellow and Black predefined as well as White (paper), Registration and None. The Black, Registration and None cannot be redefined. There are a couple of other colours there as well, Red Green and Blue, but they're also defined as cmyk. 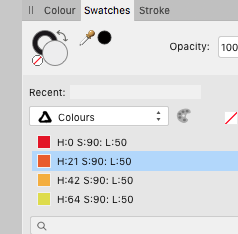 It would be good if the colours dropdown has these colours defined in cmyk and not HLS. You can set up the document to have the process colours, but it would be nice to have this as a default. It just seems odd to have a print document with HLS colours defined as you would only use cmyk or the pantone equivalents.